Looking for fortune? Maybe the lucky frog can help! 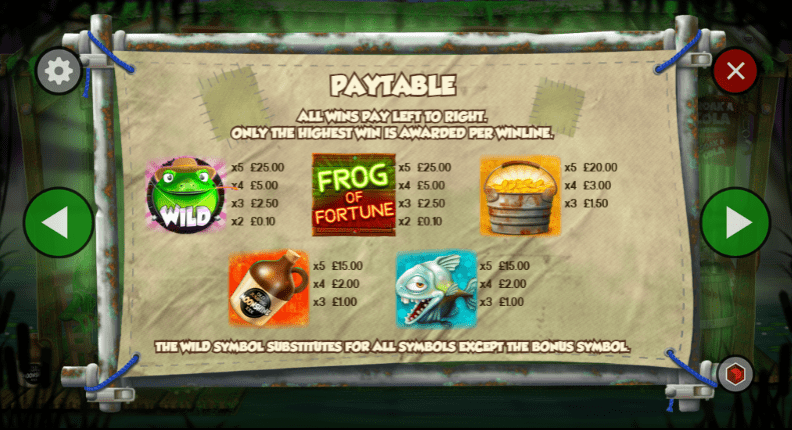 Frog of fortune is a 5 reel, 20 payline slot developed by Core Gaming with a frog theme available at Wizard. In this slot, you'll find mountains of gold and lots of mystery fortunes. The design is very shiny, colourful and golden just as the name would suggest with added adorable frog characters. Frog of Fortune is an entertaining slot and has some great features including Smokey Dokey Wilds, Cotton Shakin' Wilds, Frogs Free Spins and so much more. Jump into the fun as you find these top UK slot games today. 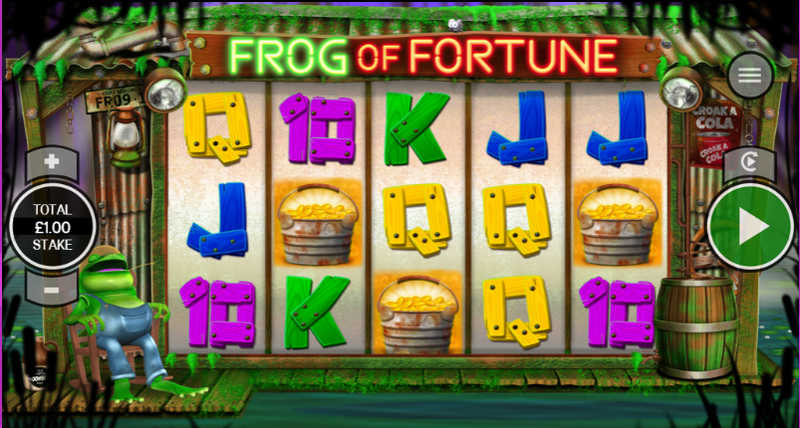 Frog of Fortune is a frog-themed slot with 5 reels and 20 paylines. It has an adorable frog theme with colourful 3D animations. Behind the reels, you'll see a swamp where the lucky frog and his friends live. Symbols include colourful wooden playing card symbols, buckets of gold and frogs. This is only one of the other online best slot games to play. Wild symbol - The wild symbol in this slot replaces all other symbols apart from the scatter to form winning combinations. Bonus Scatter - The bonus scatters appear on reels 1, 3 and 5 only. Landing two on reels 1 and 3 will unlock the 5th reel. Bonus Rounds - There are 8 bonus rounds in this slot and on every spin, Mr. Frog will award one of the following: Wild Reels, Random Wilds, Mega Symbols, Random Multipliers, Bonus Rewind, Cash Bugs and Bonus Chances. During the random wilds round, random wilds will appear on the reels and will reveal a cash reward when it comes to a stop. The frog then awakens and activates a set of random wilds. Another fun one is the random multiplier. The frog will let out a massive burp which will reveal a multiplier prize. Cash Bugs is also great fun as bugs will suddenly fly across the screen (all attached with multiplier prizes). The frog will then catch one and whichever one he spits out is the prize you will receive. Frogs Free Spins - 14 free spins and 1 super spin will be awarded once this feature is activated. You will then be shown a different screen showing a river. You'll see lily pads and logs float across the screen. If the frog lands on any symbol with a log or lily pad attached, you'll have the chance to win some great prizes, so what are you waiting for? Looking for mega fortune? Then you have come to the right place! Frog of Fortune is a fantastic slot with so many entertaining features. With 8 bonus rounds and mini-games, there are plenty of chances to win some fantastic prizes. Why not also try Fruits and Jokers: 40 Lines?